Disc 4: From the Special Features screen, highlight "The New Recruit: On the Set with Rachel Nichols". Press your Right button twice to make a target appear. Press your Enter button for a piece about Balthzar Getty. Disc 4: On the Special Features screen, highlight "Main Menu". Press your Up button, then your Left button to make a target appear. Press your Enter button for a piece about the cargo ship. Disc 4: On the Special Features screen, highlight "The Bloopers of Alias" and press your Right button twice. 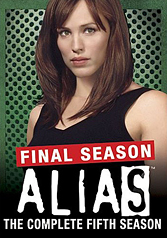 Press your Enter button for a farwell message from the crew of "Alias". Disc 4: On the Main Menu, highlight "Episodes". Press your Left button followed by your Down button to make a target appear. Press your Enter button for a tour of Carl Lumbly's Trailer.